Synopsis: Tim Robbins stars as Bob Roberts, a radical folksinger turned senatorial candidate, in this satirical comedy that blends his campaign trail with singing, music videos and scandal. Bob Roberts is a hilarious film that will change the way you look at American politics! eyelights: the numerous cameo performances. the foot tapping. Bob Roberts’ outrageous lyrics. eyesores: Bob Roberts’ inane songs. Bob Roberts is the antithesis of The Candidate‘s Bill McKay: he’s a social and fiscal conservative, of the Christian Right variety, who rabidly tries to turn back the clock on all the gains of the civil rights movement and the peace movement of the ’60s. Whereas McKay has visions of a better future for everyone and wants to protect the vulnerable, Roberts preaches the religion of “me, myself and I” and in no uncertain terms tells the vulnerable to go ! @#$ themselves. Back in 1992, he was meant as parody, of course. However, the latest breed of right-wing pundits and pinheads are merely a few mild exaggerations away from this cartoon character. A folk hero in the literal sense, some of Roberts’ most dramatic statements come in the form of his country-folk recordings, ironically tailored to echo Bob Dylan. In them, he sings about the disadvantaged as though they were a plague and about reaping the easy rewards that come with being advantaged. A soundtrack album was apparently due for release by Warner Bros., but Tim Robbins (who wrote and directed ‘Bob Roberts’) decided to keep it on the shelf so that the songs could never be used outside the film’s context. Although it might have been financially rewarding for him to release his songs, I believe that this proved to be a cautious move – the last thing he would want would be for his satire to be taken at face value and lauded for its “message”. In ‘Bob Roberts’, we go behind the scenes. On the campaign trail, we discover that Roberts has a shrewd investment team working with him at all times, massaging his stock portfolio even whilst on the road. Through interviews with Roberts, his staff, his followers, his opponents, and commentators of all stripes, we get an excellent overview of the man and the issues at hand – including a little dirt on a few scandals that are bubbling just beneath the surface. What’s fascinating is the sheer number of familiar Hollywood faces featured in this film; every other moment you’d see someone you recognized. From the obvious, such as Susan Sarandon, to the less-so, such as a remarkably svelte Jack Black (in his first significant role), just about everyone popped up in this one. I was especially impressed with Alan Rickman, who plays one of Roberts’ operative (and who also financed the picture), and Gore Vidal, who, amazingly, worked without a script. It seems likely to me that Robbins got his casting cue from Robert Altman’s pictures (coincidentally enough, he would appear in Altman’s next two features, ‘The Player’ and ‘Short Cuts’), especially the ones from that era: he gathered friends and friends of friends together with a common goal in mind. It’s not 100% clear to me if these actors were supportive of ‘Bob Roberts’ political agenda, but I suspect that they must have been in on the joke if they were in the picture at all. 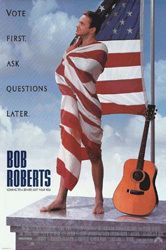 ‘Bob Roberts’ merely covers the character’s background briefly and then focuses on his election campaign. But it does its best at loading its gun and firing a few shots at the political machinery that chugs out candidates as well as the cult of personality. It’s not nearly as hilarious now as it might have been at the time of its release, given just how prescient some of it was, but it hits its target soundly and it deserves credit if only for that. But, above all else, ‘Bob Roberts’ is an excellent first feature from up-and-coming director Robbins, whose next film would be the multiple award-winning ‘Dead Man Walking’. Sadly, he would end up only making a few films, deciding instead to focus on his acting career. Although he has had great roles in tremendous pictures (‘The Shawshank Redemption’ and ‘Mystic River’ come to mind), to me this will forever remain a tremendous loss.